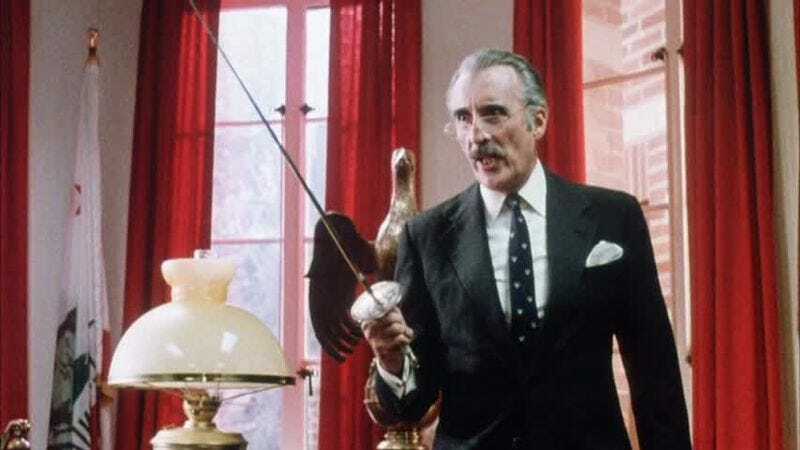 Among his many titles—Commander Of The Order Of The British Empire, “Spirit Of Metal” award winner, Count—the late Christopher Lee held one that might be the most badass of them all: the record for most appearances in films with swordfights in them. From his early roles in Hammer’s Dracula movies or as the villainous Rochefort in The Three Musketeers up through performances like the spry Sith Lord Dooku in Attack Of The Clones, Lee spent much of his career wielding implements of death at his less-charismatic foes. And now, thanks to an old clip that’s resurfaced on YouTube, you can learn to battle and belittle your foes with that same élan. The video is an excerpt from The Many Faces Of Christopher Lee, a 1996 documentary that featured the then-74-year-old actor holding forth on his various storied roles. During this portion, he picks up a rapier and gives the viewer a brief demonstration of his swordfighting skills and history, wryly remarking on all the cuts and scrapes he’d picked up over his already-long career. His moves in the video may be a bit slowed with age, but the energy on display is still impressive, and there’s honestly nothing like hearing Lee purr lines like, “The most important thing about a swordfight… is to make it look like you intend to kill the other person, and as quickly as possible,” in that iconically smooth voice.